Omega-3 with DHA. During pregnancy & breastfeeding. 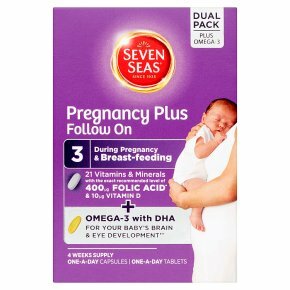 21 vitamins & minerals with the exact recommended level of 400µg folic acid & 10µg vitamin D Seven Seas Pregnancy Plus Follow On combines our expertly blended 21 vitamins and minerals with a high purity Omega-3 DHA/EPA capsule in a convenient dual pack. Modern diets may not achieve the government recommended intake of two portions of fish a week, one being oily to maintain healthy Omega-3 levels. Seven Seas Pregnancy Plus Follow On can also be taken as a general postnatal supplement for breastfeeding following childbirth to support nutritional levels and assist the body following pregnancy even if you are not breast-feeding. For foetal and infant health one of the most important Omega-3 fatty acids is DHA, a key component in the development of your baby's brain and eyes. ** This formulation is designed to be taken throughout your pregnancy and whilst breast-feeding. Seven Seas Pregnancy Plus Follow On Multivitamin Tablets This includes 400µg of Folic Acid. The Department of Health recommends that women should take a daily supplement of 400µg of folic acid for the first 12 weeks of pregnancy, when the baby's spine is developing. Provides essential nutrients throughout pregnancy including Folic Acid, Vitamin B12 & Iron which play an important role during the full nine months, such as contributing to normal blood formation and reduces tiredness and fatigue. Plus a daily intake of 10µg Vitamin D, the Department of Health recommended level for pregnant and breast-feeding women. Each capsule contains 640 mg Omega-3 Nutrients. Providing more than the minimal level scientifically recommended by the UK Government & a team of independent experts at the Scientific Advisory Committee on Nutrition (SACN). Omega-3 DHA contributes to the development of your baby's brain and eye development**. **The beneficial effect is obtained with a daily intake of 200mg of DHA in addition to the recommended daily intake for Omega-3 fatty acids for adults, i.e. : 250 mg DHA and EPA. Dosage Take one tablet (Lilac blister) and one capsule (Silver blister) a day. Best taken with food. If you forget to take a tablet or capsule, don't worry, simply miss a day. Do not exceed the recommended dosage. Food supplements are intended to supplement the diet and should not be regarded as a substitute for a varied diet and a healthy lifestyle.<br>This product contains iron which, if taken in excess, may be harmful to young children - Keep out of sight and reach.<br>DO NOT EXCEED RECOMMENDED DOSAGE.<br><br>KEEP OUT OF THE REACH OF YOUNG CHILDREN.